“How Chefs Roll” takes you inside the kitchens of local chefs to see how they roll with seasonal flavors, their favorite ingredients and how they prepare them for their restaurants. Dave Taylor, director of culinary development for the Jeff Ruby Entertainment Group, cooks steak with a certain ease and precision. He knows the exact moment to pluck a steak out of the broiler, while holding a conversation and giving occasional instructions to his staff. Of course, you wouldn't expect anything less from a steakhouse chef who goes through half a ton of steaks in a week. Jeff Ruby Entertainment Group is the force behind four renowned steakhouses – three in Cincinnati and one in Louisville – with a fifth steakhouse slated to open in Nashville in May. 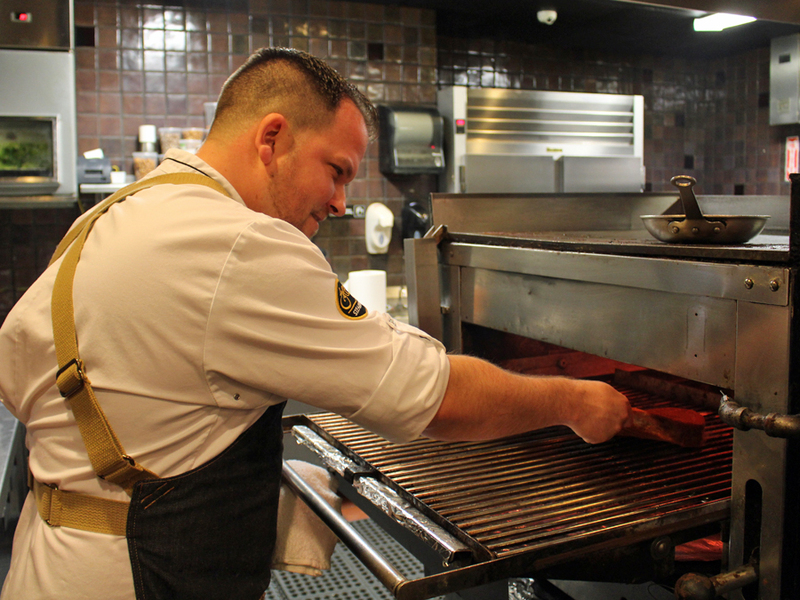 Taylor joined Jeff Ruby's Steakhouse as executive chef in July 2014, and in just a year, moved up to his current position. Originally from St. Louis, Taylor moved to Mason with his family as a teenager. He started washing dishes at Houston Inn at age 14, and his subsequent restaurant jobs shaped his desire for a career in the restaurant business. Armed with that goal, he went to business school at Bowling Green State University but pivoted to a more immediate passion: cooking. "I left college with the intent to go to culinary school," Taylor said. Instead, he jumped right into the kitchen, first at the Chokolate Morel, and since then, other notable restaurants such as Honey, Lavomatic, and most recently, La Poste. When I caught up with Taylor, he was getting ready to show me his favorite way to prepare the "cowboy:" a 22-ounce rib eye steak. It's a thicker cut, prodigious with marbling, suggesting a juicy outcome. Not surprisingly, the Jeff Ruby group puts prime importance on beef. "We have the Jeff Ruby heritage line," Taylor said, referring to the particular lineage of beef they source. Jeff Ruby serves USDA Prime beef raised from purebred Heritage Black Angus cattle. 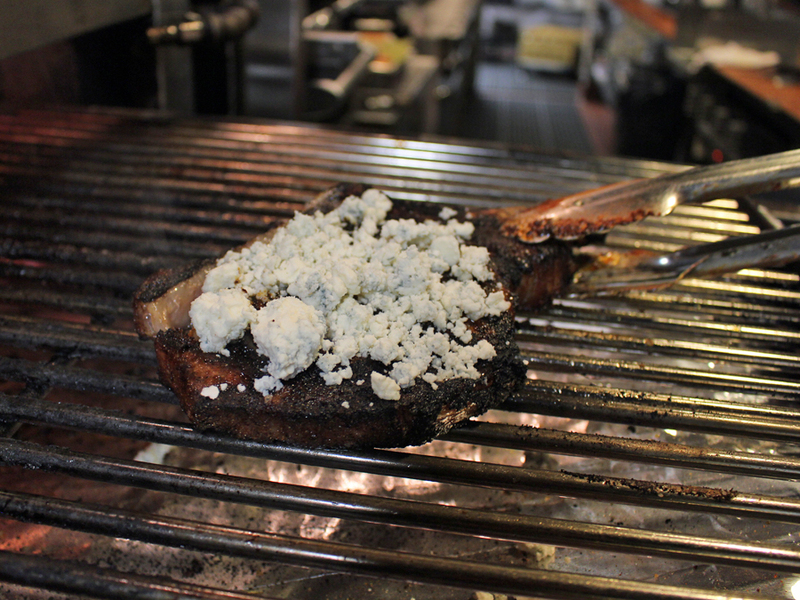 "I personally enjoy a dry-aged steak with a little blue cheese melted on it. That's what we're going to do today," Taylor said. He ladled brandy peppercorn sauce into a small pan and placed it on a flat-top griddle above the broiler to start heating it up. The sauce is built from veal demi-glace, green peppercorn and its brining liquid and finished with brandy. The kitchen makes the veal demi-glace from scratch, starting with a stock created from roasted veal bones, mirepoix, herbs, tomato paste and red wine. The stock is then reduced to a potent and thick sauce - the demi-glace. Dave Taylor coats a rib eye with Jeff Ruby seasoning blend prior to broiling. Photo by Grace Yek. Taylor gently laid the rib eye on a sheet pan brimming with lively orange-red seasoning. "For all our steaks, we use our Jeff Ruby seasoning, a custom-made blend," he said, evenly coating the steak with the seasoning. The chef adjusted the rack to control how close the steak got to the flames, thus regulating how the steak got cooked. However, he did not move the steak around on the rack. "The whole thing about a broiled steak is to handle it as little as possible," he said, adding that the more the steak gets moved around, the more unevenly it will cook because of the inherent hot and cold spots in the broiler. 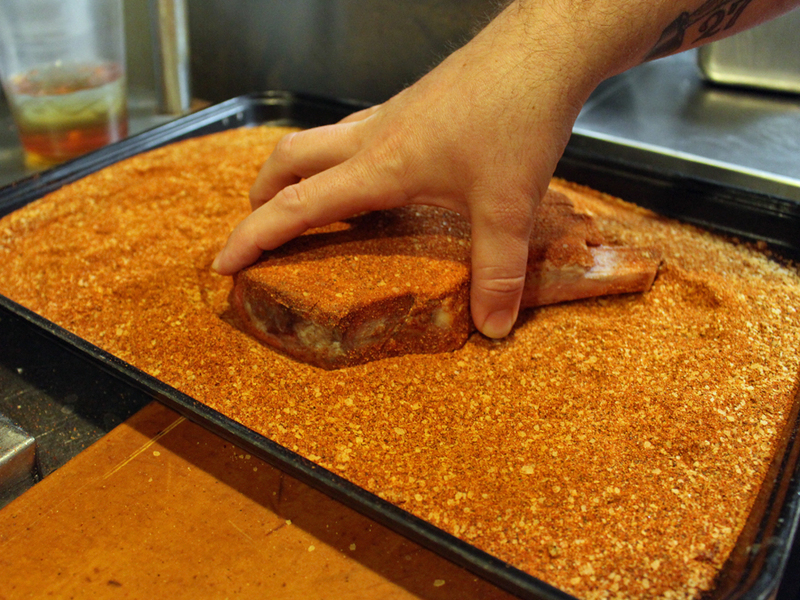 "For this cut and thickness, I would say six to seven minutes on each side to cook it to medium," Taylor said. He poked the steak with his index finger as a final check for proper doneness. "I want to feel how much the steak gives back," he said. Then he layered crumbles of Maytag blue cheese on top of the steak and returned it to the broiler for about 30 more seconds. It was just enough time to partially melt the crumbles but still leave bits intact. Taylor pulled the steak from the broiler, put it on a wooden block and spooned the hot brandy peppercorn sauce into a metal ramekin. As he drizzled extra sauce over the steak, he grinned and said, "This is how I would enjoy it." As the chef cut the steak into manageable strips for tasting, the pink in the center of the meat signaled a perfect medium doneness. The pungency of the blue cheese rose up to lead my first bite, but then gave way to the fullness of the meat. The strong flavors held up to each other in a most satisfying way. Taylor told me he likes "simple, clean, straightforward food that's executed correctly." I can tell you everything about that rib eye was correct.